Why do ants march in procession? Marching in procession is not seen in all species of ants. It is only the ants of species that habitually carry food in a team of dozens of ants that march in procession. 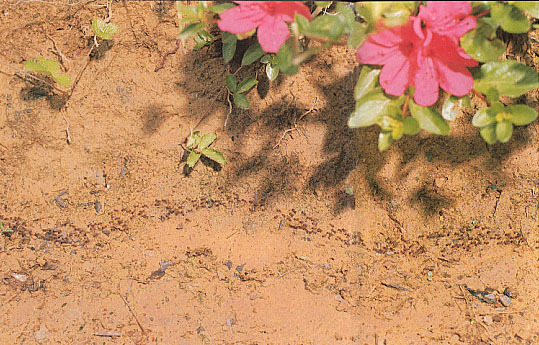 In such species＊, a worker ant that has discovered a food source leaves an odor trail as she walks back to the nest. To leave such an odor trail, the ant secretes an odorous substance in drops from glands at the end of her abdomen on her way back to the nest. 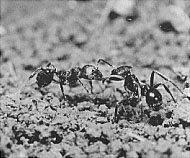 On reaching the nest, her excitement and feeding of the other workers stimulate them into activity, but instead of dispersing at random from the nest entrance, the workers march in procession because of following the odor trail left by the scout ant. As mentioned in the above-described examples, in ants, odor and sound made by rubbing their body surfaces correspond to language used by humans.